BY MALIA ZIMMERMAN – HONOLULU — So much for free shipping. Moving a container here from Los Angeles costs nearly 10 times more than moving that same container from Los Angeles to Shanghai, some three times farther. The Freight of All Kinds rate to ship a 40-foot container from Los Angeles to Shanghai is $790. Matson Navigation Co., Hawaii’s largest carrier, charges $8,700 to ship that same container from Los Angeles to Honolulu, according to the company’s website. Shipping that container from Hong Kong to Los Angeles is $1,986; from Shanghai, to Los Angeles, $1,885. And that cost for shipping to and from Hawaii from the west coast is set to rise again. 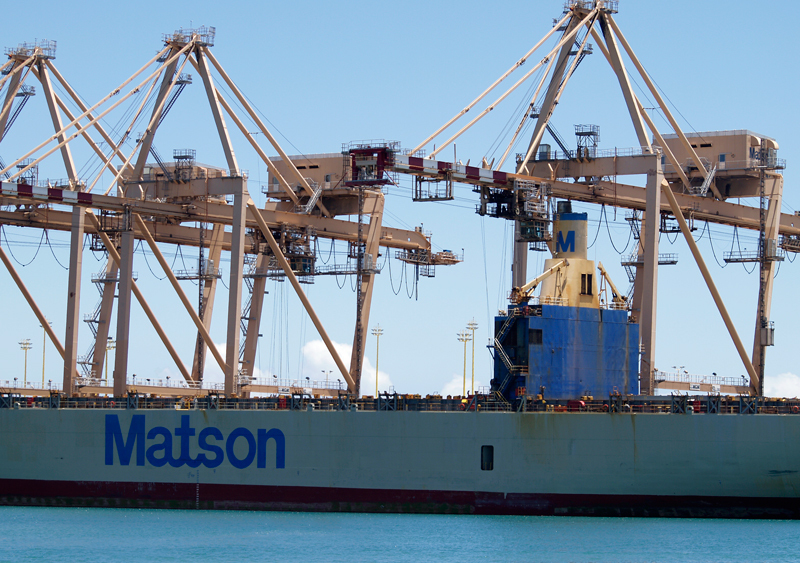 Matson announced Monday shipping rates will increase January 5, 2014, by 5.5 percent for the route from the West Coast and Hawaii, amounting to $175 per container to Hawaii and $85 per container returning to the mainland. Terminal handling fees will also increase between $25 and $50. “This rate increase will help offset rises in operating costs and support ongoing investments in our Hawaii service. The adjustment is consistent with our longstanding philosophy of implementing modest, incremental increases as necessary to maintain the highest levels of service, and is identical to increases implemented in 2012 and 2013,” said Dave Hoppes, who is senior vice president of ocean services for Matson. The Jones Act, or the “Merchant Marine Act of 1920,” requires goods shipped on cargo containers be transported between American ports on American manned and owned ships by American crew.” It decreases competition in the shipping industry and allows American companies to increase prices dramatically, economists say. “These restrictions, while benefiting a few powerful insiders, multiply by many times the cost of ships and labor that are allowed to service the islands. These restrictions eliminate many products that we could buy and many customers to which we could sell our products around the world. These restrictions prevent us from accessing the newest, most efficient and most sustainable technologies,” Schoolland said. Hawaii attorney John Carroll is challenging in the constitutionality of the Jones Act. “Why should Matson get away with predatory pricing on shipping? The law should be set aside altogether, or at the very least Hawaii should be given an exemption,” said Carroll, who filed an appeal Nov. 14 on his initial case — it was dismissed earlier this year — challenging the Jones Act. “The people of Hawaii must be made aware of the damage the Jones Act shipping restrictions are inflicting on Hawaii’s economy and the harm brought into the lives of everyone in Hawaii,” Carroll said, noting an estimated 80 percent of what is consumed in Hawaii is imported, and 98 percent of that comes by sea. The Drewry Maritime Research, a national research and advisory organization for the maritime sector, last week issued a controversial report calling for a repeal of the Jones Act. Powerful and well-funded supporters of the law dismiss the Drewry report as self-serving. They maintain a U.S.-flagged fleet is vital for the nation’s national and economic security. That’s not necessarily the case in Hawaii. Gov. Linda Lingle, a Republican who served from 2002-2010, and Gov. Neil Abercrombie, a Democrat in office since then, are vocal supporters of the Jones Act. As is President Obama. Key members of Hawaii’s current congressional delegation — including Sens. Mazie Hirono and Brian Schatz and Rep. Colleen Hanabusa — back the Jones Act. Matson’s purchase of two new container ships, at $209 million each, from a shipyard in Pennsylvania made Drewry curious. The Journal of Commerce reports vessels of a comparable size could be built in Asia for less than one-fifth of that price. “The last time Matson ordered four 2,890-TEU (20-foot-equivalent-unit) ships at a U.S. shipyard, which were delivered between 2003 and 2006, they cost around $125 million each, which was around four times higher than the market price in Asia at the time. So the cost differential is getting larger,” the Journal of Commerce said. Besides the cost of building new ships, wages have increased, soaring 31 percent in 10 years, the Drewry report said. Lingle and many other supporters, including the past four U.S. presidents, have said the Jones Act plays an important role in keeping an America fleet ready in war-time and in maintaining a strong economy. Lingle maintains an objective analysis of the Jones Act cannot be reduced to an argument about lower shipping costs. It also must focus on national security interests, which include protecting the American shipping industry from collapse based on economic pressure from foreign competition. But Schoolland, who wrote the award-winning “Jonathan Gullible” series used to teach economics around the world, says that “security” should not be for companies afraid of open competition in the marketplace, or for politicians and their lobbyists afraid of allowing our citizens freedom to choose how to spend their money. This professor has right, “mercantilist favor to special interest shipping lobbies that strangle the economic life of the people of Hawaii.” !!! The security aspects of this can be addressed if it is repealed… unfortunately the lobbyists in favor of maintaining this strangle-hold on Hawaii consumers – will continue to have more influence than the consumers, until these politicians are voted out of office…. which unfortunately isn't anytime soon… Hawaii consumers will just continue to get ripped off until they figure out the scam that is happening here. As a shipper – freight forwarder, forced to pay these outrageous costs to the ocean carriers (and pass them on to consumers), all I can say is I have no sympathy for the ocean carriers, only sympathy for my family, friends, and neighbors who are all faced with dealing with what amounts to a monopoly. I have read yr article of Nov. 26 with much interest. By chance I am trying to provoke a real " debate" about this subject in the Journal of Commerce. They started this as a "LinkedIn debate" about savings in fuel with a dual system, fuel-oil and LNG, but did not know what it is all about. And when I made my comments, they wished to stop the debate immediately as you can see below. The negative effects of excessive cabotage restrictions on world trade have been noted by the World Economic Forum in Davos earlier this year. This needs much more attention than presently is given to the subject; it is not only about the great problems for Hawaii that you have mentioned and Puerto Rico. Therefore I would like to enter in contact with the people you mention in yr article and see if they are interested to exchange information and see how we can bring this subject to the forefront. Hope to hear from you soon. Where are the Federal Anti-Trust laws set in place to encourage competition, fair-trade pricing and limit the power of lobbyists, special interest groups and similar profit-minded robber-barons? And to wrap it all up in a "security" minded package just adds insult to injury; eliminating transparency, truth, fairness and the evolution of outdated laws that are clearly profit based, not security based; using fear to once again brush aside any public discourse or updating legal precedent like the Jones Act. Its simple greed, wrapped up in a shiny christmas bow for Matson just in time for the holidays.